Castaway Island, Fiji is a pristine private island 4 star resort located in the heart of Fiji’s Mamanuca Island group. The island’s 174 acres are covered in rich tropical rainforest and surrounded by white sand beaches, vibrant coral reefs and azure South Pacific waters. The resort offers traditionally inspired individual bure accommodation with stylish and spacious interiors. Sixty six spacious ‘bures’ (bungalows) featuring traditional Fijian style thatched roofs are nestled amongst lush tropical gardens or at the water’s edge. 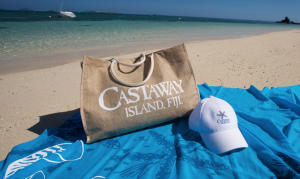 As the winner of the Best Overseas Family Holiday Resort by Luxury Travel Magazine and many other family resort accolades, let’s just say we know a little bit about how best to cater for family holidays in Fiji.